AN Ennistymon school principal has intervened in a bid to secure emergency accommodation for a local Traveller family living in “sub-human living conditions”. Ennistymon National School principal, Helen Sheridan has expressed grave concern for the physical and mental health of Caroline Sherlock and her seven children as a result of living in a small caravan on the side of the road near Cregg beach, on the outskirts of Lahinch. In a letter to county manager, Tom Coughlan, Ms Sheridan stated five of Caroline’s children were “visibly shaken” by their ongoing accommodation crisis, when they returned to school in September, despite the best efforts of their teachers to help them settle back. The principal noted that her five children are good attendees and are all doing well at school. The council stated there is one vacant family home in Traveller accommodation in Ennistymon that is available. “There are also two units undergoing refurbishment that will be available in the near future. All households approved for Social Housing Support are entitled to avail of financial supports to assist with private rented accommodation in their area of choice. The draft Traveller Accommodation Programme 2014-2018, currently on public consultation, outlines the Council’s plans for future provision of Traveller accommodation,” added a council spokesman. Having known Caroline for the last seven years, Ms Sheridan described her as an “excellent mother”, who is very supportive of the work carried out at the school for her children. The principal confirmed two of her children have special educational needs, have access to a special needs assistant and have frequent appointments with HSE personnel. Caroline’s family is currently living in a small caravan at the side of the road without electricity or running water. “They don’t have enough beds or space for the family and have no toilet or washing facilities. Caroline and I are very concerned about the safety of her children. “Their caravan is located next to a beach, a river and on a very dangerous bend on a well-transited road between Lahinch and Miltown Malbay,” Ms Sheridan stated. She said recently there was a “near miss” for the family when a delivery van left the road and narrowly missed hitting the caravan. “Cregg Beach is frequented by rowdy drinkers on weekend nights. Caroline can’t let the children out to play because of dangers posed by road, river and sea. These sub-human living conditions are taking their toll on the physical and mental health of Caroline and her children,” she added. Ms Sheridan has pleaded with the council to find suitable accommodation in the Ennistymon area for the Sherlock family, as soon as possible. A local doctor is also supporting the family’s appeal for help. In a letter to the council, Dr Michael McGovern requested the council to find “suitable accommodation” at least for the winter months, as the conditions the family are living in are “wholly unacceptable”. “I have an ongoing concern for the welfare of Caroline and her family. All the more so now the weather has become cold, particularly at night. I saw two of the children in my surgery with respiratory tract infections. One of the children fell in the caravan and cut his lip as there is no proper lighting,” he stated. According to a recent memorandum from the Department of the Environment on Traveller accommodation, Section 24 of the 2001 Local Government Act allows a county manager to carry out works necessary for the provision of a reasonable standard of accommodation in an emergency situation. 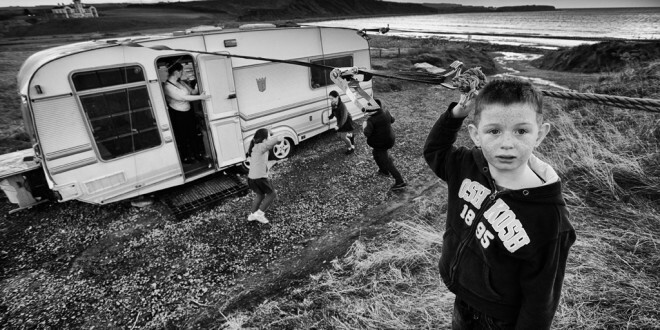 “Pending the provision of suitable permanent accommodation, local authorities should review the position of Travellers on the roadside or other unauthorised sites in their functional area in light of the Guidelines on Basic Services and Facilities for Caravans and seek to improve the position of these families by considering making available such services, including water, toilets and waste removal if there are no significant legal, planning, environmental, social, technical or other restraints in so doing,” the memo stated. If a council house can’t be provided, Ms Sherlock requested a mobile home so that her older children will be able to sleep in separate rooms and have heat and a place to cook meals. She also needs a portable toilet and an electricity supply. Ms Sherlock maintains she isn’t in a position to return to another Traveller halting group house, as this is “impossible” for her to do, again for the sake of her children. “Peoples’ lives are falling apart on Traveller schemes due to the small, tight and overcrowded places they have to live in, because everyone is unemployed living behind high walls cut off from the world.I don’t want that living environment and depression for myself and my children. I’m trying to make a better life for myself and my children, not to go back to the dangerous and frightening times that we had to live through every day,” she said. She claimed the family couldn’t find suitable rented accommodation because of “prejudice” and were told by council staff there were no local authority houses available. Even with homelessness payments, she said hotels and guesthouses, hostels and bed and breakfasts were rejecting their applications for short-term stays.